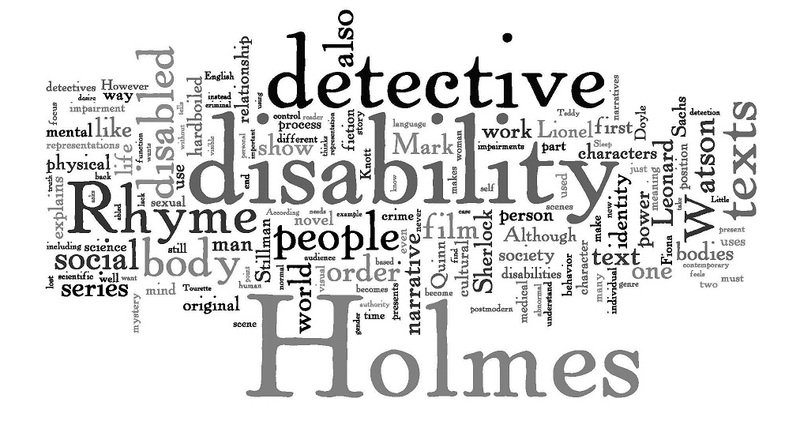 Finding Stability Through Narratives of Disability in the Detective Genre"
The appearance, use, and philosophy of the disabled detective are latent even in early detective texts, such as in Arthur Conan Doyle's canonical Sherlock Holmes series. By philosophy, I am referring to both why the detective feels compelled to detect as well as the system of detection the detective uses and on which the text relies. Because the detective feels incompatible with the world around him (all of the detectives I analyze in this dissertation are men), he is driven to either fix himself, the world, or both. His systematic approach includes diagnosing problems through symptomatology and removing the deficient aspect. In the original detective genre, the narrative assimilates bodies to medical and scientific discourses and norms in order to represent a stable social order. Contemporary detective subgenres, including classical disability detective texts, hardboiled disability detective texts and postmodern disability detective texts, respond to this framework by making the portrayal of disability explicit by allocating it to the detective. The texts present disability as both a literary mechanism that uses disability to represent abstract metaphors (of hardship, of pity, of heroism) and as a cultural construct in and of itself. I contend that the texts use disability to investigate what it means to be an individual and a member of society. Thus, I trace disability in detective fiction as it parallels the cultural move away from the autonomous individual and his participation in a stable social order and move towards the socially located agent and shifting situational values. "The swing of [Holmes's] nature took him from extreme languor to devouring energy... for days on end, he had been lounging in his armchair amid his improvisations and his black-letter editions. Then it was that the lust of the chase would suddenly come upon him" –Arthur Conan Doyle "Red-Headed League"